Sister Ann Bernadette McNamara, I.H.M. 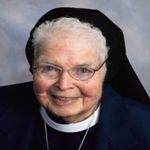 Sister Ann Bernadette MacNamara, I.H.M., 90, died June 8. She was in the 71st year of her religious life. Born in Philadelphia, Sister Ann entered the Congregation of the Sisters, Servants of the Immaculate Heart of Mary in 1944 from Most Blessed Sacrament Parish in Philadelphia and professed her vows in 1946. She taught in the elementary and secondary schools in the Archdiocese of Philadelphia and the Diocese of Arlington, Va. Sister Ann served as regional superior, and she was elected for two terms as I.H.M. Congregation Councilor, and also served as superior at Immaculata University. Her funeral Mass was celebrated June 11 at Camilla Hall in Immaculata. Msgr. Joseph Logrip was the celebrant, and Fathers William E. Dean and Brandon Horan were concelebrants. Sister Ann is survived by members of her I.H.M. community, her sister-in-law Marcella (Joseph) and many loving nieces, nephews, grandnieces and grandnephews. She was predeceased by her parents James and Josephine Caffrey MacNamara and brothers, Thomas (Elizabeth), Robert (Charlotte), James and Joseph.